Last week I booked a couple of days off work, and decided to get out into the wilds for a bit of a hiking, and an overnighter in a bothy. Turns out there were three within reasonable hiking distance of Corrour railway station, so I picked one most likely to be quiet, and set off on an adventure with my giant backpack. Corrour station is famous for several reasons, and getting the train there is well worth doing. For a start, it’s on the West Highland line. This runs from Glasgow to Oban, Fort William and Mallaig, and it’s widely considered to be one of the greatest train journeys in the world. Less than an hour out of Glasgow, the scenery suddenly turns dramatic and wild, and keeps getting more and more spectacular. I won’t attempt to describe it – just take a trip and see it for yourself. Honestly, you won’t regret it. 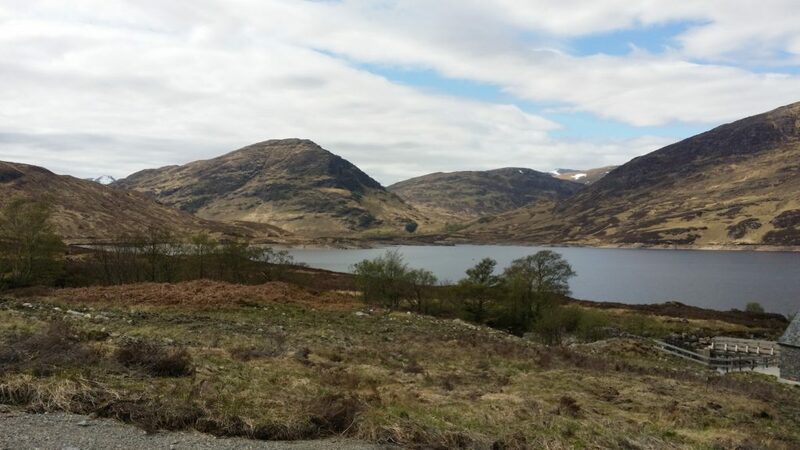 Mountains, lochs, forests, rivers, a few stags, a lot of sky – whenever you do it, the views are amazing. Anyway, Corrour is one of the most isolated stations on the line – it’s around eight miles from the nearest road, and as such there’s no vehicle access. The only ways in are on foot, by bike, by train – or helicopter. 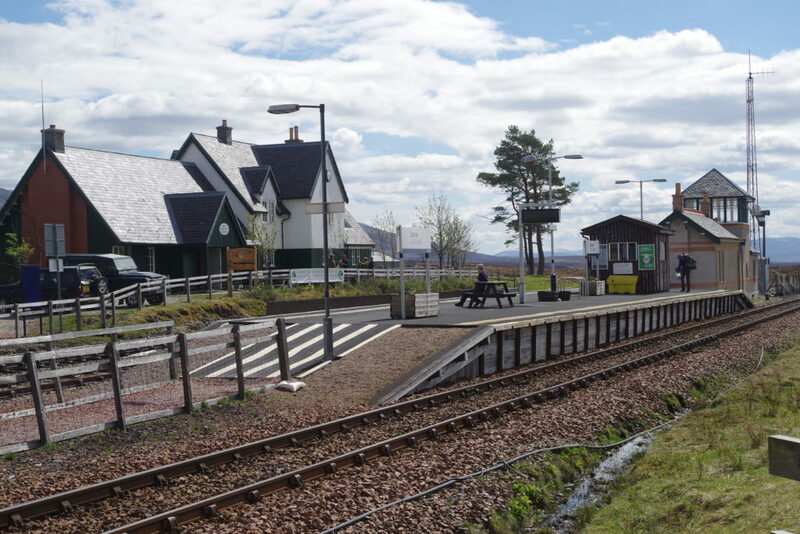 As a result, Corrour is one of the busiest stations on the West Highland, even though there’s not much there, and there was a brief flurry of activity when my train arrived. A few got out, a few boarded, and assorted hikers set off on the paths that head to various locations. The station itself is somewhat smaller than the others on the line, and is very spectacularly located. If it looks familiar, this is where the cast of Trainspotting ended up when they wanted to reconnect with the Scottish landscape. Back in those days, the station truly was a lonely spot, but since 1999, it’s been home to a succession of businesses in a large house next to the tracks. It’s on the site of the old signalman’s house, which was lived in well into the eighties when there was an operational signal box here. It now houses a rather upmarket restaurant and bar, and offers accommodation. I stopped off for a drink and a bowl of soup before I started my hike, and found it a rather nice place, although it’s a bit expensive and was full of rather annoying people with overly loud voices. It’s open all day, every day for a large chunk of the tourist season, and is therefore extremely useful, given that trains here are few and far between – they don’t seem to mind people using it as a waiting room. Oddly enough, you can travel direct to and from London courtesy of the Caledonian Sleeper, for a pretty amazing contrast in your surroundings. I used to work for the Sleepers, and wrote some of their emergency plans – one thing we had to think about was how we’d rescue people if the trains couldn’t run, and people were stuck on the station overnight! I suggested a Caledonian Sleeper-branded helicopter on standby, but that idea didn’t get past the accountants. The station is also famously the highest on the UK rail network, with the highest point on the line announced by this sign near the station. 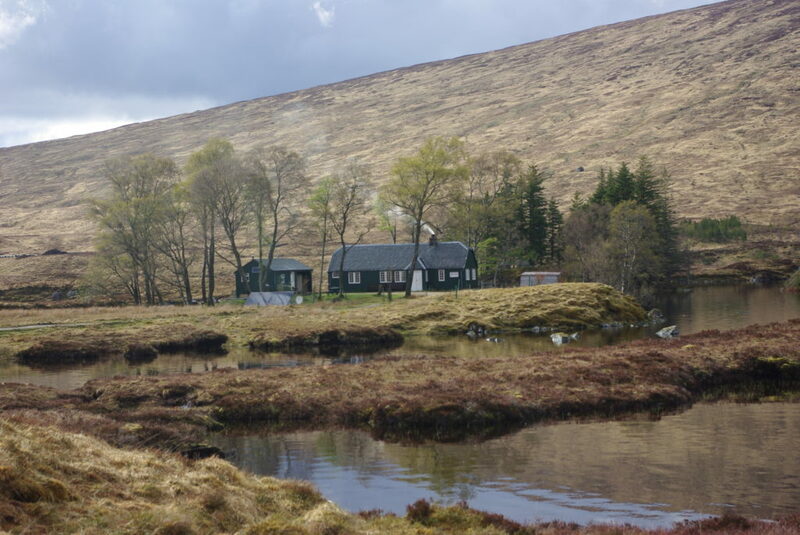 Also in the area, about a mile away from the station, is Loch Ossian Youth Hostel. 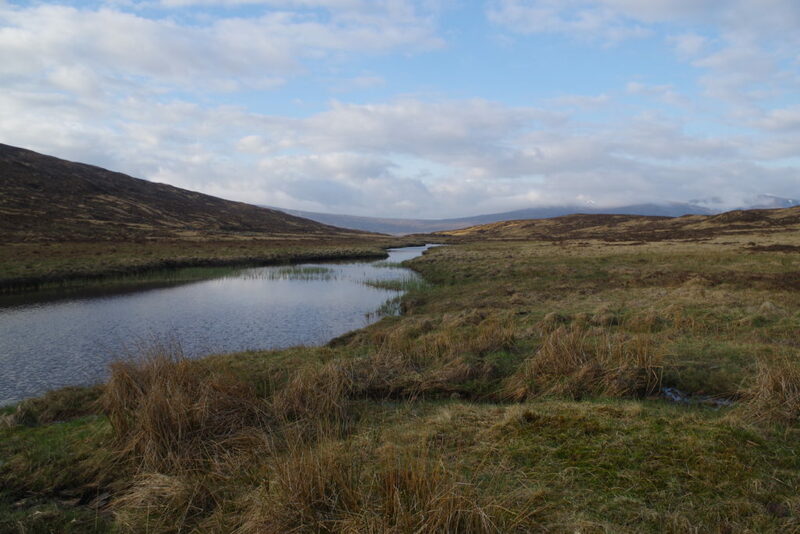 This has now become very well known, so booking a place at it can be a challenge, but it’s well worth doing – I stayed here with a friend about three years ago, and its location next to the loch is just gorgeous. It’s basic as hostels go, but positively palatial compared to your average bothy. I didn’t intend to go near it on this trip, but did pass close by on my way back (more on that later). Here’s a shot from when I stayed there three years ago. 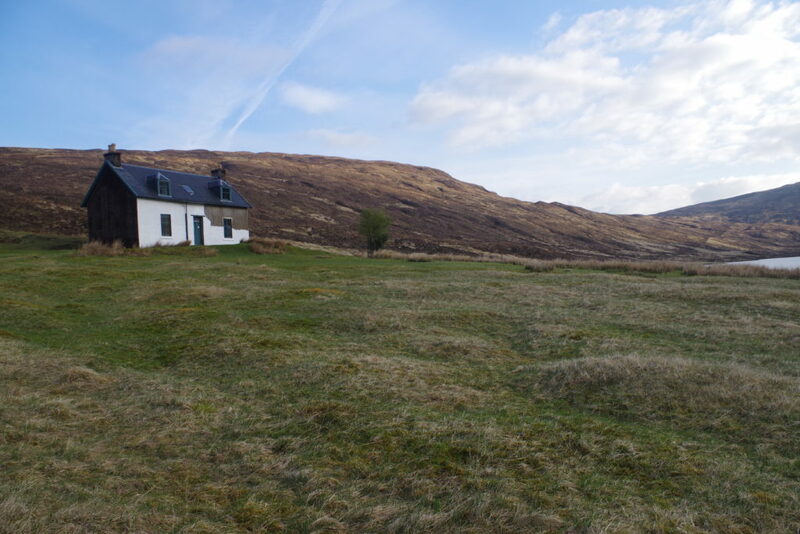 So…freshly loaded with soup from the restaurant, and in magnificent weather, I started my trek of approximately 8 miles to Loch Chiarain bothy, my home for the night. 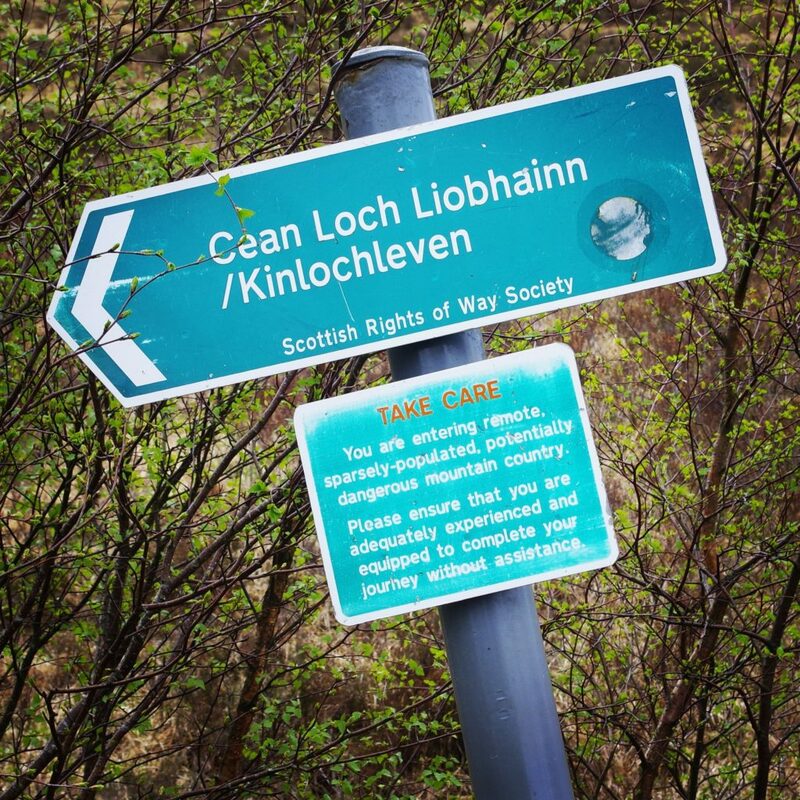 I started off heading towards Loch Treig, along a path heading towards Spean Bridge. It ran quite close to the railway for some time, but it turned out very tricky to follow – the ground was extremely boggy indeed. I soon managed to sink shin-deep in some mud and almost lost a boot in the process. Thankfully it wasn’t too disastrous and my foot stayed dry, but it was a bit scary and stressful navigating this part, and it made me realise that perhaps hiking poles are a good idea after all. Still, I eventually made it to a good solid track that was used for building a hydro-electric plant recently, and this made the walk down to the loch very easy. Loch Treig was absolutely gorgeous and pretty deserted, so I lingered for a while before pressing on – it was a great spot for a rest, in wonderful peace and quiet. I did see one or two other walkers, but I pretty much had the place to myself. After walking around the edge of the loch for a bit, the walk turned decidedly more challenging. They seriously weren’t kidding when they put this sign up. There followed a very long hard slog up a pretty unrelenting slope, that once again was extremely boggy. The path, where you could actually find it, had been completely trashed by offroad motorcyclists who had reduced it to a rutted slippery swamp. In places it was extremely hazardous and walking over it was exhausting because you couldn’t get into a decent rhythm. I managed to slip over and acquire a few more mud stains in the process, but thankfully no injuries. That said, there were plenty of locations where a simple error could have led to a very serious, possibly even fatal, accident – this isn’t a hike to take lightly, and it did make me think about needing to equip myself better and develop my fitness a bit. However, there were quite a few other walkers about, mainly heading the opposite way on some sort of charity trek, so rescue would not have been far away. Sadly the trashed path remained a serious problem right to the end of my walk, but eventually things did get a bit easier, with flatter and easier terrain. The bothy is right next to a loch, and unlike some others which are hidden until you get very close to them, this bothy is visible from a very long way away – it’s in a very impressive location. It was quite a relief to finally arrive – the hike took over five hours and really wore me out! You never know quite what you’re going to find arriving at a bothy, but at out-of-the-way ones like this, you usually don’t have to worry about too much – getting there is too much of a challenge for the sort of people that just want to get plastered. I actually arrived at exactly the time as another walker coming from the opposite direction, but after looking around for a few minutes, he decided to press on. After that, I didn’t see a soul, and had the place to myself. My sources of bothy information suggested that this one was less popular than a couple of others in the area due to being a bit lacking in atmosphere, and I can see what they mean – it’s a bit bare compared to some others, but it’s large and has all the things you need. I stayed in an upstairs room with a decent sleeping platform, a fireplace, and a table and chair. I had some fuel with me and soon got a nice cosy fire going, which was useful as I washed my trousers in the loch – they were pretty dry again by the morning. 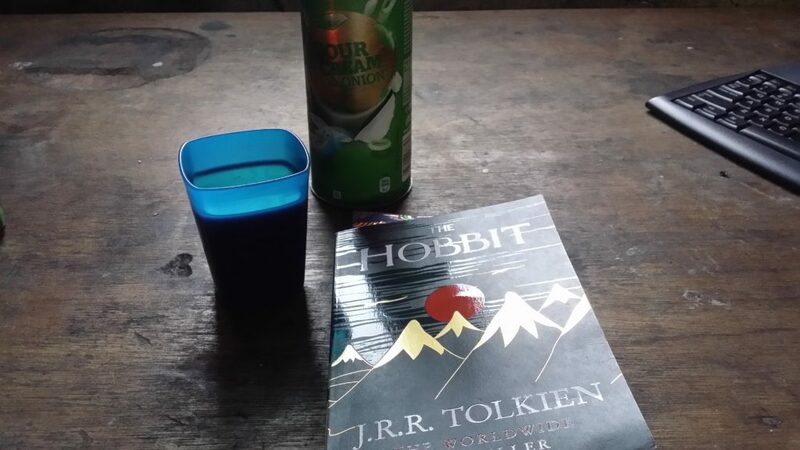 The evening was spent eating, reading, savouring the atmosphere and surroundings, and sleeping the sleep of the just. It was a lovely spot. 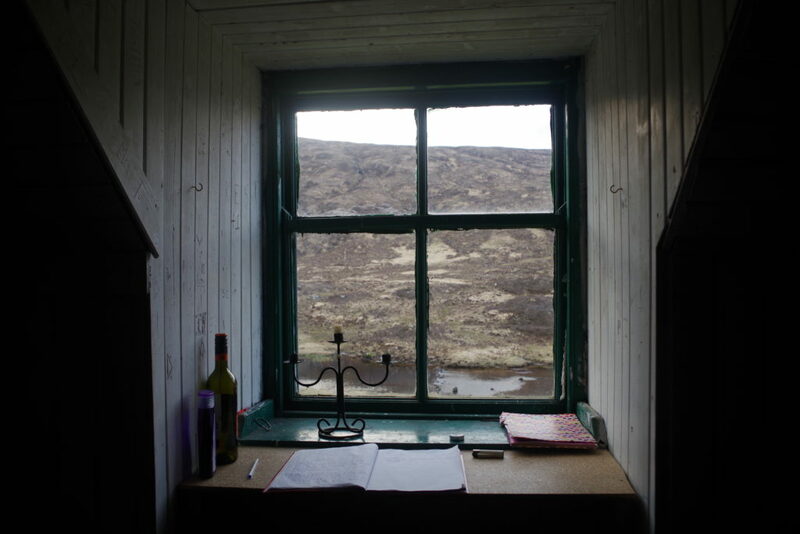 Waking up in the morning completely alone in amazing surroundings is something you just have to experience for yourself, and is a truly special part of the bothy experience. The hike back was a bit easier, because I knew what to look out for and managed to avoid the worst of the boggy bits. Navigation was a bit easier, as I just had to head for Loch Treig. Once I’d reached the edge of the loch, it was back on the solid path again, and life was much easier. When I got to the bottom there, I took a left for a quick detour to a nice geocache. I don’t tend to bother with many caches these days, but it was rude not to in such a nice place! I intended to go and look at another bothy in the area, but the weather began to turn a bit, and it was an extra couple of miles hiking, so I didn’t bother. 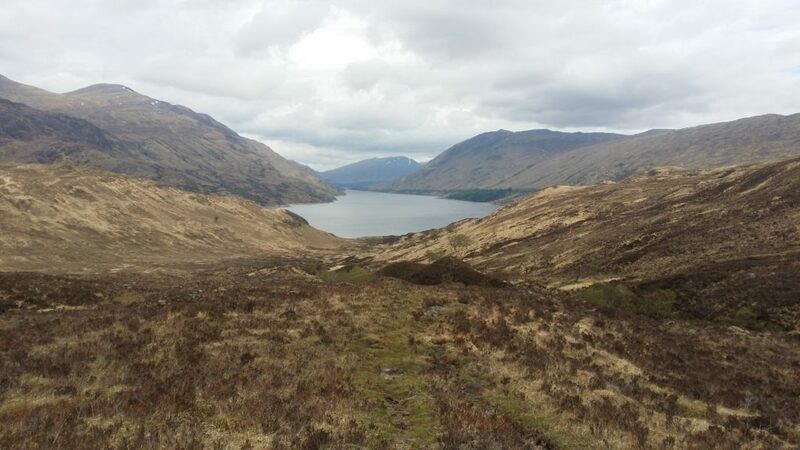 I’m quite glad I didn’t – although it was on a good path, there’s a long hard slog uphill from the loch towards the station, and it was hard going. Rather than face the horrors of the bog again, I followed the estate road on an elongated loop past Loch Ossian and back to the station. It continued climbing steadily for some distance, and the route was a LOT longer. I did over 30,000 steps that day and was just about ready to die when I got back to Corrour. I had a long wait for the next train to Glasgow, so I was rather glad of the restaurant – first priority was getting some liquid inside me, and then the next order of business was attacking a big bowl of a very rich stew. It was just what I needed. Three hours of stunning scenery rounded off the day on the train back to Glasgow. I was stiff as hell for a day or two afterwards, but it was seriously worth it. Absolutely brilliant to challenge myself a bit, and to enjoy peace and solitude in such a wild and remote place. It really does put things into perspective. I am also sadly addicted to Great British Railway Journeys and I remember the episode featuring Corrour Station. It’s absolutely fascinating that the train is really the only easy way of getting to the place. 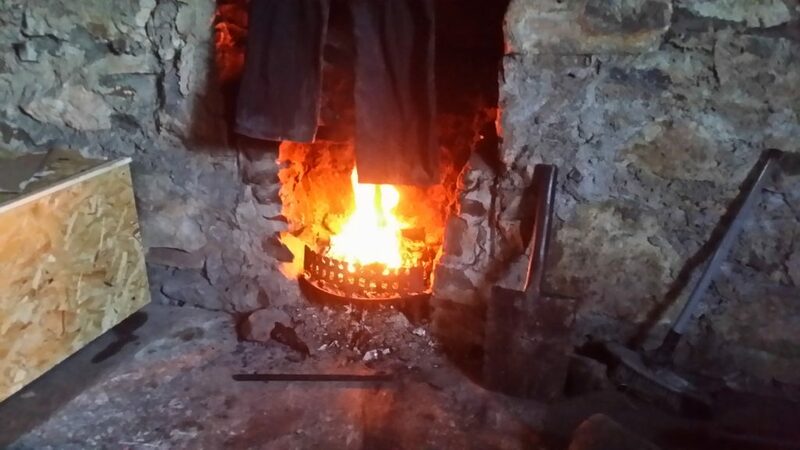 Yes – the bothy system is an amazing resource. Unfortunately in becoming more widely known about, they’re in danger of getting overloaded and abused, but they’re great for spontaneous getaways in the sticks. I guess that’s part of a bigger problem, though – tourism can place a lot of landscapes under strain. 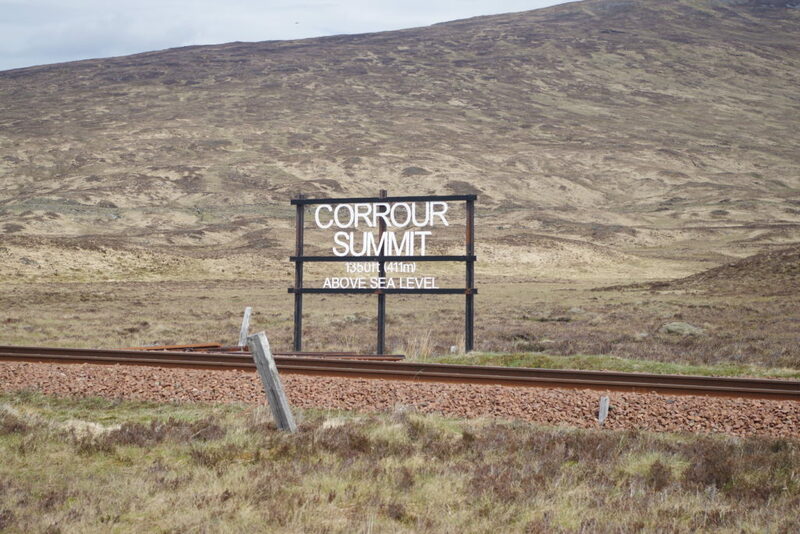 Corrour isn’t unique in being so inaccessible – famously even more remote is Altnabreac station on the Far North Line, which is used by a tiny handful of people. I’ve been there once before, but I’m keen to return to do the fifteen-mile hike from there to Forsinard. Apparently it’s incredibly rare to see another human while doing it.